The vehicle surveillance market is expected to grow from USD 49.93 Billion in 2015 to USD 103.21 Billion by 2022, at a CAGR of 11.1% between 2016 and 2022.The report aims to estimate the market size and future growth potential of the vehicle surveillance market across different segments such as products, vehicle types, and geography. The base year considered for the study is 2015 and the market size forecast is given for the period between 2016 and 2022. The growth of the vehicle surveillance market would be primarily driven by factors such as regulations in different countries mandating in-vehicle surveillance products, benefits offered by in-vehicle surveillance systems, increasing sales of premium cars, and the increase in traffic fatalities which demands better traffic control solutions. The vehicle surveillance market ecosystem includes component manufacturers and software providers, product manufacturers, system integrators, and distributors. The major stakeholders in the industry include vehicle surveillance product manufacturers such as Robert Bosch GmbH (Germany), Delphi Automotive PLC (U.K.), DENSO Corporation (Japan), Continental AG (Germany), Honeywell Security Group (U.S.), Hangzhou Hikvision Digital Technology Co. Ltd. (China), COMM-PORT Technologies (U.S.), Law Enforcement Associates (U.S.), and SecuScan (Germany). According to the MarketsandMarkets forecast, the vehicle surveillance market is expected to grow from USD 49.93 Billion in 2015 to USD 103.21 Billion by 2022, at a CAGR of 11.1% between 2016 and 2022. The growth of the vehicle surveillance market is primarily driven by factors such as regulations in different countries for mandate of in-vehicle surveillance products, wide range of advantages of in-vehicle surveillance systems, and increasing sales of premium cars. The report covers the vehicle surveillance market on the basis of in-vehicle surveillance by product, vehicle type, and region; under-vehicle surveillance market by type; and out-vehicle surveillance market by type. The market is further segmented on the basis of regions into North America, Europe, APAC, and RoW. The fixed type of vehicle surveillance systems dominated the under-vehicle surveillance market and is expected to be the same till 2022. Technologies such as autonomous cruise control system (ACCS), lane departure warning system (LDWS), blind spot detection system (BSDS), parking assist system (PAS), and others have enabled the advancement of the automobile industry and promoted the growth of the passenger cars segment worldwide. The U.S. as well as several countries of EU have introduced regulations which mandate certain driver assistance system types in passenger cars as well as in commercial vehicles, which drive the in-vehicle surveillance market. North America is expected to hold the largest share of the market and dominate the vehicle surveillance market between 2016 and 2022. The increase in the demand for premium cars with advanced safety features, increase in population, and improved standard of living would give momentum to the Asia-Pacific in-vehicle surveillance market. However, the complexity and high cost of in-vehicle surveillance systems restricts the growth of this market. 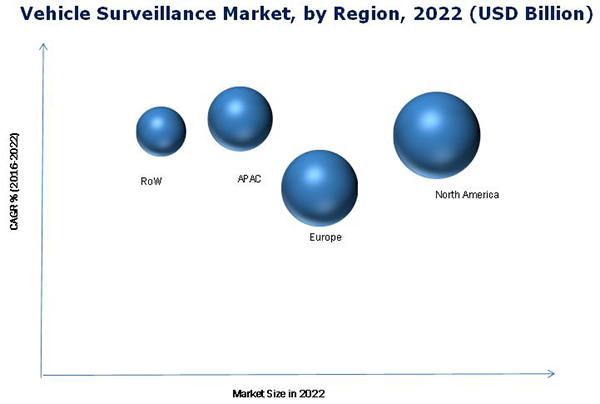 The major vendors in the vehicle surveillance market include Robert Bosch GmbH (Germany), Delphi Automotive PLC (U.K.), DENSO Corporation (Japan), Continental AG (Germany), Magna International Inc. (Canada), Autoliv Inc. (Sweden), Valeo SA (France), Honeywell Security Group (U.S.), Hangzhou Hikvision Digital Technology Co., Ltd. (China), Bosch Security Systems (U.S.), Zhejiang Dahua Technology Co., Ltd. (China), FLIR Systems Inc. (U.S.),, COMM-PORT technologies (U.S.), Law Enforcement Associates (U.S.), and SecuScan (Germany).